At James Street South, we take the finest Northern Ireland produce and serve up #greatfoodeveryday, for lunch and dinner, Monday to Sunday. The award winning restaurant offers a modern dining experience in the heart of Belfast City Centre, combining the freshest, locally sourced produce with an exciting wine list. 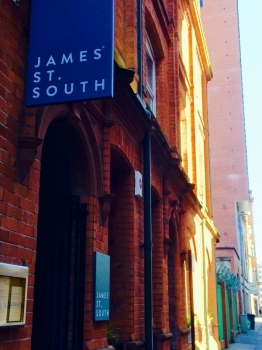 James Street South was opened in 2003 by award winning Chef, Niall McKenna, who is actively involved in running the restaurant and producing great food every day with his team. The restaurant has recently undergone a refurbishment by Aidan McGrath of McGonigle and McGrath Architects, and has a modern, contemporary feel with its extensive pass and bar area running the length of the restaurant, making it glamorous and unique; the perfect place to sample some of Northern Ireland’s finest cuisine. At James Street South, Head Chef, David Gillmore creates great food every day by combining classic cooking with the best locally sourced produce, serving up signature dishes, including Strangford Lough Bouillabaise and Organic Lamb. For more information, see our range of menus. Niall McKenna is also the owner of The Bar and Grill, and Hadskis, both of which offer a unique and distinct dining experience, combining great hospitality with food to match. He also runs the Cookery School at James Street South; an interactive kitchen where you can join us in creating #greatfoodeveryday.